Endless activities and high-energy worship make for an unforgettable, summer of a lifetime that will impact campers’ spiritual lives forever! Located just 30 minutes north of Tampa, the Word of Life Florida Youth Camp is dedicated to seeing every life reached and changed for eternity. Nonstop high-energy activities, engaging speakers, dynamic worship, brand new friends, and a connection with God like you’ve never experienced before all make for the adventure of a lifetime! Each week of camp is specifically designed for the age group it ministers to. Junior camp is geared to children ages 6-12, while Teen Camp is an experience perfectly suited for students ages 12-18. 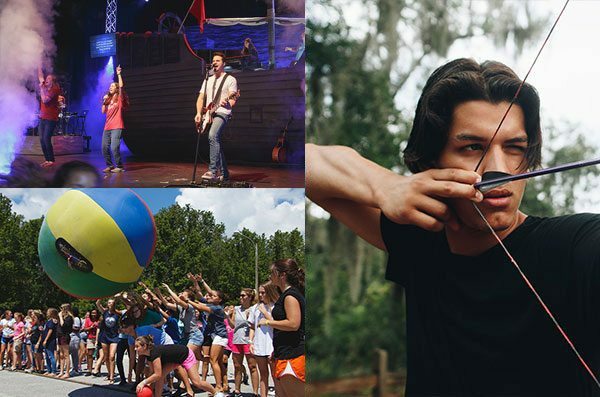 Ready for an unforgettable summer of fun at Florida Youth Camp? Check out dates and pricing for our Junior and Teen Camps below! Error: Error validating access token: Session has expired on Wednesday, 15-Aug-18 21:28:47 PDT. The current time is Saturday, 20-Apr-19 21:09:03 PDT.